Get the party started with the Big Wheel All-Terrain Cooler Wagon by Creative Outdoor. This wagon is made up of a removable canvas fabric that attaches to a steel frame via snaps and hook-and-loop fasteners. The steel frame is foldable and features flat tubing for extra strength. 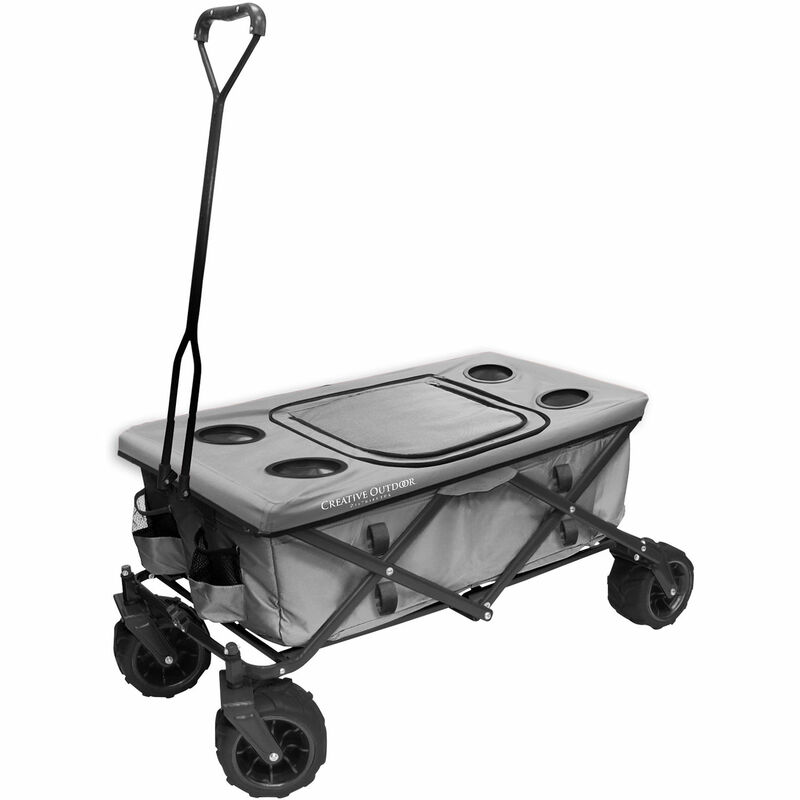 It unfolds in just three steps and, once put together, it can carry up to 120 lb of cargo. Conveniently transport food, beverages, and gear to everything from sporting events in the park, to the backyard for a barbecue. At your destination, this wagon's tabletop attachment makes it easy to enjoy food and beverages. It has four built-in cup holders, and as it completely covers the top of the wagon, you have a handy spot for resting plates and drinks. A center opening accommodates an included, removable, insulated cooler bag. Keep food cool, or fill it with ice and convert it to a portable beverage cart. Dividers are also included to keep everything organized. The canvas wagon has side utility pockets and two additional built-in cup holders. Get your food and gear from point A to point B with the integrated heavy-duty metal handle. It has a high attachment point to help keep your heels from hitting the wheels. The big, all-terrain front wheels feature a 360-degree swivel to let you take the wagon almost anywhere. Box Dimensions (LxWxH) 30.9 x 21.2 x 9.85"